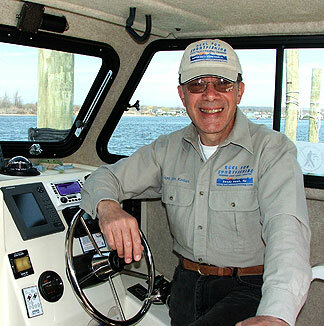 I'm a life long resident of New Jersey and I've fished the Raritan Bay and Sandy Hook, NJ waters since owning my first boat in the early 70's. Early on, my primary target were Fluke (Summer Flounder) and then later into the 80's Striped Bass. I learned many techniques fishing aboard both party and charter vessels during that time. I give seminars at trade shows and fishing clubs throughout the tri-state area on the techniques of bucktailing for Fluke as well as clamming, bunker chunking, livelining and trolling for Striped Bass. I really enjoy sharing my fishing knowledge with other anglers as we all have the opportunity to exchange ideas as well as our successes and failures. I've devoted countless hours attending seminars by some of the top captains in the New Jersey keeping abreast of the current fishing trends. I'm also on the internet often reading reports and posts of fishing trips throughout the NY and NJ fishing area keeping up with the current happenings. Most of all, I get to enjoy my time on the water with you. Good fishing, great conversation and friendly people......what else could you ask for. Life is Good....keep it Reel. The crew of Reel Fun Sportfishing do many things before, during and after your trip. They are at the boat an hour before you arrive, cutting bait and getting the boat, rods, reels and rigs ready for your trip. They also check all the safety gear before we depart. During your trip, their job is to untangle lines, re-rig fouled or nicked tackle, cut bait, net your fish and give you pointers on how to catch your fish. For your safety, they are in charge of the deck area of the boat. Once we return to port, your mate will fillet and bag all your fish. Above all, they are there to serve you. As an added bonus, most are boat owners and are avid fisherman for many years. Catching fish and enjoying the day safely on the water is what we are all about. And finally, lets talk about how they make a days pay. Mates work very hard for you. You'll see once you spend the day with us. It's a tough job and not many people can do it! My mates are the best in the business. I've been blessed with a top notch crew. The majority of their pay comes in the form of a gratuity at the end of your trip. So please, show your appreciation at the end of our trip for a hard days work for you. Generally speaking, mates work for 15-20% of the total cost of the charter.